As I’ve expressed here on the blog before, May and June of 1983 represent the summer of my geek discontent. The blockbuster movies of that summer -- from Superman III to Twilight Zone: The Movie -- proved very disappointing. But my greatest, most crushing sense of disappointment arrived after a viewing of Return of the Jedi, the final installment of the Star Wars Original Trilogy. The long-awaited film, directed by Richard Marquand, culminated with dancing teddy bears, a song urging audiences to “Celebrate the Love,” and a trio of smiling ghosts beaming happily at the living. Now, I can’t (and wouldn’t deny) that moments in Return of the Jedi remain spectacular. A speeder bike chase in the forest still impresses with its sheer sense of velocity, as well as its special effects presentation. And Jabba the Hutt and The Emperor are two worthy additions to the mythos, and both presented with tremendous flair. Plus, as a point of closure for the Darth Vader story, Return of the Jedi proves affecting. Although Steven Spielberg told Time Magazine that Return of the Jedi was the “definitive” Star War movie and Roger Ebert awarded the film four starts, not all critics agreed with the positive assessment. Vincent Canby in The New York Times called the film “the dimmest adventure of the lot,” for instance. In this case -- and against type, I might add -- I tend to agree more with Canby’s assessment. What do I object to about Return of the Jedi? Funny, because The Empire Strikes Back, with its intricate and symbolic character arc, compelling love triangle, twisted family-psychology, and downbeat ending hadn’t felt like a film for children. Funny, because Star Wars, with its mythic hero’s journey and canny cinematic allusions to Kurosawa and great historical war films, hadn’t felt like a film for children. Children could and did enjoy both films tremendously, yet there was nothing childish or simple-minded about those adventures. 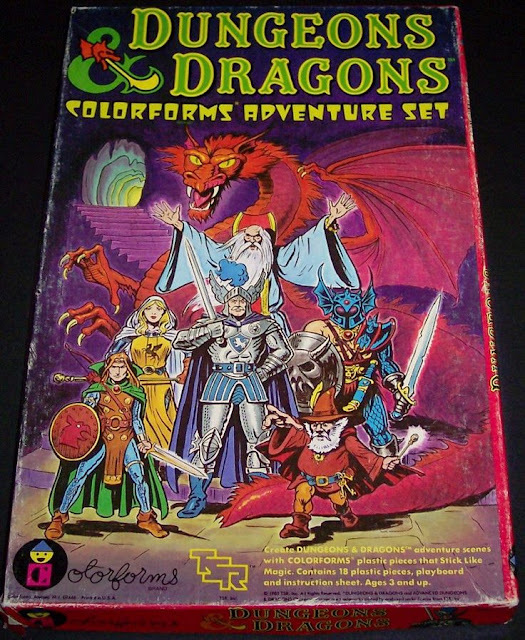 Rather, they were entertaining narratives for people of every age group and every demographic. The first two Star Wars films talked down to no audience, and didn’t rely on cheap humor. By comparison, Return of the Jedi indeed feels simple-minded and childish. Complex character relationships are resolved and cast aside in blasé, rapid-fire “let’s get through this scene” fashion. The personal character revelations countenanced here -- which would leave you or me absolutely reeling -- are shrugged off with instant, unqualified acceptance. She’s my sister? Oh, okay. Similarly, bald-faced lies from beloved characters are painted away as an alternate “point of view” without the filmmakers pausing to reflect on the true nature of the liars, or even the meaning and purpose behind those lies. Is it right to stretch the truth if your cause is just? Is it okay to deceive someone for their own protection? Return of the Jedi doesn’t delve that deep. It is well-paced, exciting, and visually accomplished in many ways, but underneath the action, there is…nothing. Perhaps worst of all, the lived-in, ultra-detailed, and very believable kitchen-sink reality of the Star Wars universe has, itself, undergone a dramatic face-lift for this film. Suddenly, unconvincing Muppets -- by the droves -- play critical roles in the proceedings, and Return of the Jedi’s sense of humor involves them belching and otherwise mugging for the camera. Not why I go to see a Star Wars movies, although I do like the Muppets very much in their own universe. And I certainly love Yoda, though he was handled in Empire with tremendous dignity and respect. The rubbery aliens in Return of the Jedi not only look horrible by contrast, but play as one-note gags. I remember thinking at age thirteen that for the first time in the saga, a Star Wars film’s make-up and special effects, looked old-hat and unconvincing. This was especially true in the scene with the giant monster called the Rancor, a scene featuring muddy brown photography, and lousy rear-projection work. When one couples Return of the Jedi’s simplistic answers to complex questions and the shift in the universe to a more overtly kiddie-friendly “fantasy land” with the film’s campy sense of humor, the rerun threat of a Death Star (because that turned out so well for the Emperor the first time he tried it…), the insulting death of a major villain (Boba Fett), the obvious merchandising opportunity seized (in the form of the Ewoks), and the abruptness and insularity of the original ending (pre-Special Edition), Return of the Jedi proves a tremendous disappointment. It’s not that it’s a “bad” film devoid of any pleasures. It’s that the film proves, in the end, an empty, by-the-numbers experience. 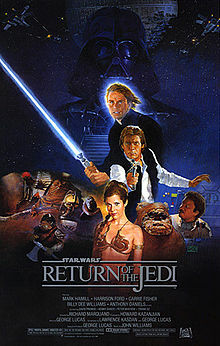 Return of the Jedi is thus the weakest of the first three Star Wars films, and one that many fans recognized, perhaps subconsciously, that represents the canary in the cold mine regarding George Lucas’s creative approach to his space saga. No more training do you require. Already know you, that which you need. Luke Skywalker (Mark Hamill), Princess Leia (Carrie Fisher), Lando Calrissian (Billy Dee Williams), Chewbacca (Peter Mayhew), C3PO (Anthony Daniels), and R2D2 (Kenny Baker) go to great lengths to rescue Han Solo (Harrison Ford) from the clutches of the vile gangster, Jabba the Hutt on Tattooine. After defeating Jabba and freeing Han, Luke returns to Dagobah to complete his Jedi training. There, Yoda (Frank Oz) informs him that he requires no more training, but that he must face Darth Vader (David Prowse) to become a true Jedi Knight. After Yoda dies, Luke encounters Ben (Alec Guinness), who explains to him that Princess Leia is actually his sister, and that they were kept separated to protect them from their father, Anakin Skywalker/Darth Vader. Meanwhile, the Emperor (Ian McDiarmid) has sprung a deadly trap for the Rebel Alliance. In orbit of the forest moon of Endor, he is constructing a new Death Star. He has sent out misinformation suggesting the station is not yet operational; misinformation which leads the rebels to hastily prepare an all-out attack. While Han Solo and Princess Leia lead a team to the surface of the Endor moon to knock out a force field generator for the orbiting battle station, Lando takes command of the Millennium Falcon on the raid against the new Death Star. Simultaneously, Luke believes that there may yet be some good within Darth Vader, and he surrenders himself to the Sith Lord in hopes of finding it. The most disappointing aspect of Return of the Jedi involves its treatment of the characters and their crises. As we all remember from Star Wars and The Empire Strikes Back, there is a Luke – Leia – Han love triangle at work in the saga. In Return of the Jedi, that history conveniently gets rewritten so that there was never a love triangle at all. Instead, Leia has “always known” that Luke was her brother according to the script. This sudden assertion of previously unexpressed character knowledge, however, sure makes it tough to explain the kisses she plants on Luke in Star Wars and Empire. She was just leading him on? Why must Leia respond to the revelation of Luke’s biological connection to her with such immediate and total acceptance? For one thing, it means that no discussion of emotions or hurt feelings or mistaken assumptions need be discussed. I suppose one could argue that Leia is slowly awakening to the power of the Force and has “sensed” the truth, yet this isn’t how she parses her feelings in the script’s dialogue. Again, Leia explicitly states that somehow she’s always known the truth. This response simply doesn’t make sense in the context of the previous two films. 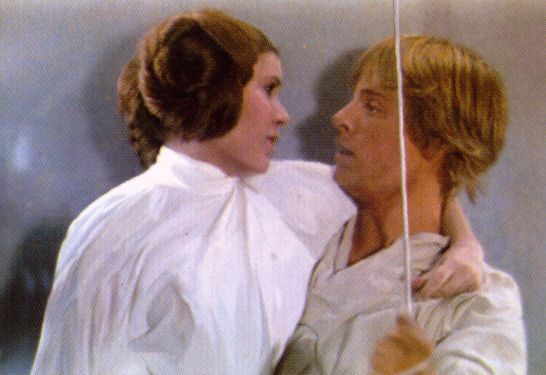 Luke, who responded with jealousy when Han began joking about a princess and a guy like him in Star Wars, similarly accepts instantly that Leia is his sister, managing to suppress his apparent feelings of romantic attraction to her without a single word of sorrow, without even a pained expression. Again, such emotions would slow down the action and necessitate…talking. I would argue that this isn’t the behavior of characters legitimately grappling with a life-changing revelation. This is the work of a screenwriter looking for a simple-minded way out of a complex character relationship that no longer serves a narrative purpose, as a saga comes to an end. It doesn’t help, either, that the reveal of Leia as Luke’s sister is pretty lame. Mention is made of Luke’s sister, and since there is precisely one – and only one – significant female character in the Star Wars mythos, little mystery is generated over her identity. Ben laughably notes that Luke’s insights serve him well when he names Leia as his sister. Really, who else would it have been? Mon Mothma? My beef here is that Return of the Jedi doesn’t permit Leia and Luke the opportunity to act like fragile human beings when their own personal history is revealed to be completely different than what they have believed all their lives. Luke’s love for Leia immediately becomes the gentle, supporting love of a sibling, and the same is true of Leia’s love for him. They suddenly -- as though possessed by spirits -- start acting like brother and sister. In my experience, human emotions simply don’t work like that. At the very least, there would be a period of surprise, and perhaps even some shame or revulsion, since the signs of romantic attraction between the two characters were not exactly subtle. I’m not saying I want Star Wars to become Oedipus, by the way. I’m saying that I want the characters to acknowledge the difficulty of what is clearly a transformative and emotional moment in their relationship. A moment of a little awkwardness, rather than immediate acceptance, would have been a good start. The Empire Strikes Back: Remember this? If Luke and Leia are denied the space to act as real human beings might act in a situation like theirs, Ben Kenobi and Yoda are handled even more shabbily in Return of the Jedi. Rather than admit that he lied to Luke about his father, Ben suggests that his statements were actually true, from “a certain point of view.” But his precise words were that Darth Vader betrayed and murdered Luke’s father. There’s no way to parse that statement as anything but a lie. It’s not true, from any reality-based point of view. Vader didn’t actually kill Anakin. Anakin chose his own path, based on his character weaknesses and the actions of those around him. He became Darth Vader in response to his environment and his crises. It’s one thing to believe in relativism, and indeed, I do. It’s quite another to twist the facts and hide behind relativism as an excuse for a lie. I submit Ben does the latter, and his actions expose him as a bit cowardly. A truly heroic or noble character would indeed admit his lie, and note it for what it was: a lie of convenience told to a boy who, at that point in the story, was not ready to learn the truth. If Ben had made that statement, few would hold a grudge or judge his character poorly. But to weasel out of the lie by refusing to acknowledge it as such is, actually, rather shameful. Yoda also comes off poorly in Return of the Jedi. Luke asks the old master if Darth Vader is really his father, and Yoda turns away…to take a nap. He just wants to go bed, you see, and attempt to avoid the question all together. This is the tactic of a great and noble Jedi Knight in touch with the Force? Avoid and distract? There is a mitigating explanation here, but not one available if you dismiss the prequels out of hand (which I don’t, by the way). And that explanation is simply this: the Jedi have become corrupt and arrogant, and Yoda and Ben are symptoms of this corruption and arrogance. The Jedi who “returns” in this film -- Luke Skywalker -- eschews their typical Jedi beliefs (including the edicts don’t help friends, and don’t let love impact your choices), and becomes a Jedi on his own terms. Luke saves the universe not by loving too little, but my loving his father -- Darth Vader -- very much. I rather like that paradigm, and believe there’s a valuable lesson there. But the problem with this interpretation is that Return of the Jedi doesn’t play Ben or Yoda as fallen, imperfect creatures that strayed from the path of righteousness. Rather, they are held up as the forces of good, and not held to account for their lies, distortions, and misleading statements. What role did they play in Anakin’s fall? Wouldn’t Luke want to know that? Wouldn’t Luke like to know that Kenobi was the one who scarred and mortally injured his father? After all, it was the Jedi, under Kenobi and Yoda, who took young Anakin away from his mother and never let him see her again. They made him hide his love for Padme, and feel ashamed about it. They didn’t just push…they practically shoved Anakin to the Dark Side. And now, here, they are caught, red-handed, manipulating Luke -- just like they manipulated Anakin -- and instead of recognizing that they are making the same mistake twice, they try to shirk responsibility for it. I don’t know if this is just bad writing or muddled writing, but the scene with Ben and Yoda in Return of the Jedi feels like a splurge of (necessary) exposition that needs to be powered through, not a moment that grows organically out of the characters and the beliefs they would legitimately hold. In short, I can accept that the Jedi became corrupt, impotent and confused as we saw in the prequels, but I need Return of the Jedi to somehow note that Luke is a different model; one whose experiences and friendships have improved the discipline. The movie doesn’t make that connection in any substantive way, at least as far as I can detect, and it very much needs to accomplish that task. The core of the OT is the Luke/Leia/Han relationship. That friendship is central to everything, and it must mean something. And what it should mean, I submit, is a rejection of the Jedi principle that you must sacrifice “connections” to those you love if you want to be a hero. Anakin wanted to connect to others, and wasn’t allowed to, and feared losing the connection. But Luke saves the galaxy by building a connection to his father and, essentially, changing his father’s heart. In broad terms, what’s being discussed here is the idea of changed or altered premises. The screenwriters behind Return of the Jedi (Kasdan and Lucas) are clearly operating by a different set of premises than was clearly established on-screen in Star Wars and The Empire Strikes Back. We’re supposed to forget and dismiss the love triangle of the previous films (they’re brother and sister!) and simultaneously forget the things that Ben told Luke about his heritage (it’s true…if you look at it from my point of view…really, what’s your problem, Luke?). To wrap things up neat and tidy the way it wants, Return of the Jedi must make mincemeat of the previous films, and especially the emotional truths we experienced in those films. The changed premises are cheats, and they never feel right, or ring true. On a level of simple continuity, Return of the Jedi doesn’t even track well with The Empire Strikes Back. Yoda begged Luke not to leave for Bespin in The Empire Strikes Back because Skywalker’s training was incomplete. He still had much to learn. Yet as Return of the Jedi opens, Luke is a Jedi Knight…and yet he has not returned to Dagobah to complete his training as Yoda desired. He finally does go back to Dagobah, and then Yoda announces, basically that he needs no further training. The only thing left is to face Vader. Well, Luke has already faced Vader, and at the very same point in his training. Which is it, Yoda? Does he require more training or no? Again, this is either muddled writing, or overt manipulation on the part of Yoda. In terms of characters, I also must also note that Han Solo is given absolutely nothing of significant interest to do in this film, and that he is ill-served by a screenplay which transforms him from lovable scoundrel into a love-struck puppy. Again, changed premises were at work here. Han Solo was too interesting, too charismatic a hero in The Empire Strikes Back. So much so that he often overshadowed Skywalker. Now, the balance is restored, but not by growing Luke as a character and human being, but rather by neutering Han. He’s a non-person in this film, little more than comedic relief. Another changed premise: the fearsome nature of Boba Fett. We were primed in 1980, in the lead-up to The Empire Strikes Back, for a new and deadly villain in the Star Wars universe: a bounty hunter named Boba Fett. And indeed, when he finally saw him, he was a significant threat indeed. He was the only villain who saw through Han’s ruse with the Imperial garbage, and he successfully retrieved Solo at Bespin. He escaped, unscathed, from the battle there…essentially triumphant. Yet in Return of the Jedi, Boba Fett’s rocket pack accidentally activates when he is -- again, accidentally -- struck by a blind Han Solo’s harpoon or battle staff. Then, with an undignified scream, he careens into the Sarlacc Pit, and it belches loudly after swallowing him whole. All that build-up of character menace…for this? Return of the Jedi should have showcased a confrontation between Solo and Boba Fett as competitors and equals, not a series of comical accidents, followed up by a belch joke as punctuation. This “end” for the Fett character renders him a buffoon, and again speaks of bad writing. Return of the Jedi rather distinctly alters the reality of the Star Wars universe. What we saw in Star Wars and The Empire Strikes Back was a real, lived-in world featuring some very strange denizens. Those denizens were weird indeed, from Ugnaughts and Jawas to Tusken Raiders, Chewbacca, and Lobot. Yet they all seemed “true” or realistic in a critical sense. When we looked at them, we could believe our eyes. Return of the Jedi’s first act, set in Jabba’s palace, represents a totally different universe. Suddenly, Muppet-sized, rubbery “cute” aliens dominate the landscape. Salacious Crumb, Max Rebo, Sy Snootles…you name ‘em. I knew at age thirteen in 1983 how utterly and completely phony they looked, and their very presence took me out of the film’s “reality” in a way no alien presence had taken me out of Star Wars or The Empire Strikes Back. They looked ridiculous then and they look ridiculous now (a lot like many of the Pod Racers do in Phantom Menace, in my opinion). These aliens look silly and childish, and that shift ties in deeply to the change in the Star Wars world, the changed premise. How many times does an alien belch in the first hour of Return of the Jedi? And how many times do they belch in Star Wars or The Empire Strikes Back? Then we have the Ewoks. I understand and enjoy George Lucas’s interesting premise, based in part on Ethiopia’s defeat of Italy in a battle in 1895. It’s the idea, simply, of a primitive-but-organized and inspired power defeating a more technological, advanced power. It’s a great dramatic idea, which is why Lucas utilizes it in Jedi and then again with the Gungans in The Phantom Menace. I also know that Lucas had wanted originally to use Wookies instead of Ewoks for Return of the Jedi. That would have been wonderful. We have some real familiarity with the Wookies because of Chewbacca, and wouldn’t feel that we are being asked to countenance an alien race that is actually a marketing ploy. But the problem with the Ewoks is that they indeed look and feel -- transparently -- like a strategy to sell toys. So like Max Rebo or Sy Snootles, the Ewoks represent a kind of external force (merchandising) leaking into the Star Wars storytelling universe itself. Once more, that’s something that did not occur with Star Wars or The Empire Strikes Back. Movie and product “synergy” is an accepted part of life today, of course, but I still find the Ewoks a blatant cash-grab that poisons Return of the Jedi’s narrative, and drains tension and a sense of danger from the final battles. And speaking of robbing tension from the film, the tongue-in-cheek tone achieves the same result. Chewbacca echoes a famous Tarzan yell at one point, like a hirsute Carol Burnett. And I could certainly do without the scenes of Ewoks learning to drive speeder bikes or knocking themselves out with bolas. There’s a word for this: cheap laughs. And again, one only need look at the saga’s history. Are there any cheap laughs in Star Wars or The Empire Strikes Back? Return of the Jedi boasts other serious problems, I maintain. The film’s main threat we’ve already seen once before: The Death Star. Since that battle station was destroyed by a handful of rebels in small fighters in Star Wars, you would think the Emperor might think twice about embarking on the construction of a second Death Star. Was there no other super weapon the Emperor could have envisioned? No new or fresh scenario, instead of a fighter attack on the planet-sized station? Instead, we get a 32-million dollar rerun. I've got a bad feeling about this. Haven't we been here before? Also -- and I realize this is probably sacrilege – the Special Edition of Return of the Jedi features a much-improved ending over the original theatrical release which was, bluntly-speaking jaw-droppingly bad. In the original film, the action never left the moon of Endor, and therefore there was no sense of tying the victory at the Death Star (and over the Emperor) to the fate of the galaxy at large. Countless millions of people across the cosmos had been freed from decades of oppression, and all we saw were Ewoks using Stormtrooper helmets as drums. The Special Editions commendably reveals celebrations on Naboo, Tatooine, Coruscant and on Bespin. I submit that’s wholly appropriate update. The original ending of Return of the Jedi -- the one I saw in 1983 -- sacrificed all sense of scope and scale in its last minutes. The balance was wrong, as it was throughout most of the picture. Now, allow me to harness my light saber and note that there are several elements of Return of the Jedi that I do appreciate. They almost all concern Luke Skywalker and his quest to find the good remaining in his father, Darth Vader. I find this portion of the film extremely rewarding, and enjoy the scenes between Vader and Luke. These characters have fought before, but suddenly they are forced to reckon with each other in a new light -- a family dimension – and so grave choices must be forged. Darth Vader is given one last opportunity to look at his life and to consider his decisions. How does he want to be remembered? Where does his allegiance rest? With the Emperor, or with his son? I believe in my heart that children have the ability and indeed propensity to change their parents’ hearts in ways that parents can’t possibly anticipate or predict. So I find it wholly believable that the scourge of the galaxy, Lord Vader, might be changed at the last minute…and indeed, reminded of his humanity, by Luke. I appreciate that Return of the Jedi takes this approach to storytelling. It’s the most human and “real” aspect of the film. I find the unmasking scene heartbreaking, and emotionally resonant in a way the remainder of the film is not. In terms of visualization, Luke’s struggle to overcome the Dark Side is powerfully wrought as well. Watching the film again this week, I realize that it was more powerfully rendered than I gave it credit for in my review of Empire. The high point occurs after Luke cuts off Vader’s hand, and then looks at his own hand. He makes a mental connection in that instant. Right there, he sees one possible (unfortunate destiny), a destiny that makes him more machine than man, and beyond reach of his human heart and soul. He decides not to take that path, and it’s a triumphant and moving moment. My own future to choose? Finally, in regards to Return of the Jedi, I hark back again to Mark Hamill’s comment in Time Magazine, almost thirty years ago. They made a film for children. In Return of the Jedi, adult relationships are reduced to cartoon stereotypes, and belching aliens and tongue-in-cheek humor replace the previous film’s psychodrama and compelling personal conflicts. Every time the film threatens to prove interesting in terms of the characters, we cross cut to another action scene, and humanity is sacrificed. Even at age thirteen, I knew I had seen a descent from genuine greatness, a substitution of pace for intelligence. Sure, it's not the steepest fall in film history, but it is a sharp descent nonetheless. John perfect review of George Lucas having his first of four Star Wars movie debacles. Something happened to George Lucas after creating the serious Star Wars(1977) and Empire Strikes Back(1980), as you stated, dumbing down the Star Wars universe for Return Of The Jedi. George Lucas truly made Empire Strikes Back(1980) a perfect serious evolution beyond Star Wars(1977) which was also serious. Too bad he failed to complete it with a equally competent Return Of The Jedi(1983). That is why I think we saw George Lucas have his first sign of Star Wars-fatigue. I really think that is why he never made episode 7, 8 or 9 in the '80s. He lost the ability to build on his own creation. George should have stopped after Empire Strikes Back. I agree with everything you said in this review. The irritation was even more pronounced because in some ways, Jedi started out so adult, with Luke's holo-self appearing so mature and self-possessed ("These two droids . . . " and the high anticipation of the resolution of Han's cryofreeze. Then come the ridiculously over-the-top cartoon-villain slimoids, belchers and farters that were so obviously aimed at the kiddie contingent, followed by the festival of "Awwwwww, cute!" on the Ewok planet. Blecch. It all definitely felt like a hard turn from a decent start, so much so that one could sit in the theater and FEEL the moment when Lucas suddenly thought, "Hey! Franchise! Merchandising!" What a giant comedown from Empire, and a huge disappointment. If it hadn't resolved a few loose threads from the earlier films, one could have comfortably ignored it completely! It always seemed apparent to me that this soulless, empty merchandising sequel without a heart and without a story signaled that Lucas had run out of ideas and forgotten what made the first two movies work, so the following dearth of the next tetralogy was never a surprise.